Released April 2008. A perennial outsider in French music, Albert Roussel was the tutor of a whole generation of composers, including such diverse figures as Eric Satie and Edgard Varèse. The three works inclided here outline the transitional phase in which Roussel’s mature idiom took shape. Most important of these is the Second Symphony with its densely intricate orchestration and its wide range of expression, while Pour une fête de printemps is a symphonic poem that could be thought of as preparation for the larger work. With Suite in F, Roussel arrived at his mature style; the piece is taut and economical in design, with a distinctly ‘contemporary’ feel. Stéphane Denève, Music Director of the Royal Scottish National Orchestra, is obviously completely at home in the music of Roussel, readily capturing the somber evocation of the Second Symphony, without making the harmonic clashes too forceful. He draws strong contrasts between the three movements, returning at the end to the introspective mood of the beginning. The plaintive feeling of the opening of the similarly arch-structured Pour une fête de printemps is well caught, and the work’s climax makes a pungent centerpiece before once again the composer returns to more peaceful nostalgia. The Suite is much more extrovert, its opening rumbustious, the central Sarabande bitter-sweet, and final Gigue again pungently boisterous. The RSNO play as if they have really lived with these scores, and the Naxos recording is excellent. A good disc for those new to the composer to find their way into his plangent harmonic world. 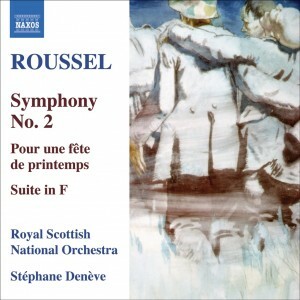 Denève and his Scottish forces previously released their recording of the composer’s two best-known orchestral works, the Third Symphony and the ballet Bacchus et Ariane [8.570245]—an issue distinguished enough for Fanfare’s resident Rousselian Adrian Corleonis to include in his annual Want List. Now they bring us the less user-friendly Second Symphony, coupled with two significant works from around the same time. …The Second Symphony dates from the composer’s “dark” period. The longest of his symphonies, it is in three movements. …The Royal Scottish National blends beautifully throughout…Denève moves the tempos along where appropriate, and achieves a genuine atmosphere of mystery in the final pages. The 11-minute tone poem Pour une fête de printemps dates from 1920 and may have been originally conceived as the scherzo of the symphony. Instead, as Roussel wrote to Charles Koechlin, it became “a sort of little symphony comprising within itself the various movements: allegro, scherzo, andante, with the slow movement at its centre.” In the same letter, Roussel emphasized that the work had no pictorial or literary program; he was turning towards absolute music at this time. This fascinating piece contains echoes of the composer’s impressionistic past as well as hints of his muscular style to come. Denève leads the Scottish orchestra in a performance full of detail and vigor, which knocks out all prior competition. The Suite in F shows the composer finally getting into his late stride. In three movements (Fast/Slow/Fast), it truly is a petite symphony, conceived for a chamber orchestra and filled with attractive neo-Classical ideas. Significantly, the movements are entitled Prelude, Sarabande, and Gigue. Denève emphasizes an appropriately Stravinskian edge to the textures, yet also finds warmth in the low central movement. Simply, this issue is first-class, both in interpretation and execution, and is spaciously recorded, making Denève’s the bargain Roussel cycle of choice (the only low-price competition coming from Dutoit’s 1980s cycle) and potentially the best choice in any price range.